The St. Louis Cardinals kick off their first home game of the season at Busch Stadium on Monday, April 11. Metro is the best option for Redbird fans to get to all of the fun and excitement without worrying about traffic and parking. With thousands of baseball fans expected in downtown for the big game, in addition to the home opener taking place on a work day, streets will be busy and parking downtown will be at a premium. 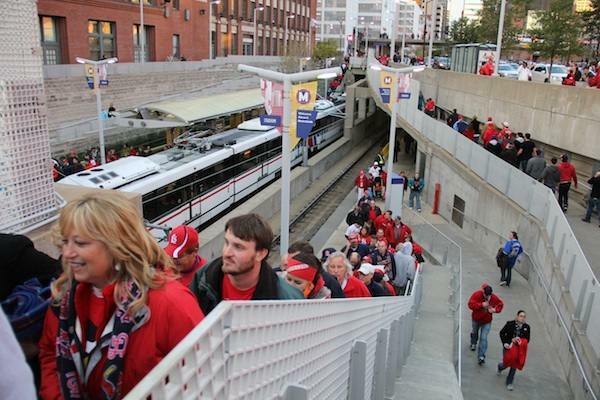 Fans can use one of the 21 free Park-Ride lots located at MetroLink stations in both Missouri and Illinois, and ride the train to the Stadium MetroLink Station or one of the other nearby MetroLink stations in downtown St. Louis to see the game or join in one of the several rallies taking place before the first pitch. MetroLink will have additional personnel located throughout the light rail system on Monday to assist passengers headed downtown. MetroLink will also monitor platforms throughout the day and add extra trains to service, as needed. MetroBus is another great option for getting to downtown St. Louis on Monday. Fans can catch the #40 Broadway or #99 Downtown Trolley, which both have stops near Busch Stadium, or ride on one of 18 MetroBus routes to the Civic Center Transit Center, located just a few blocks west of the stadium. In addition to MetroLink and MetroBus, Illinois passengers can also ride the Redbird Express to get to the home opener on Monday. The first Redbird Express leaves from the Water Tower at St. Clair Square in Fairview Heights two and a half hours before the game with service every three to five minutes. On Monday, the Redbird Express buses will begin service at noon. To plan your trip to the opening day festivities on Monday, download the Metro On The Go App, use Trip Planner or contact Metro Transit Information at 314-231-2345 or 618-271-2345, 7:30 a.m. to 4:30 p.m. Monday through Friday. Will the construction of the Spruce Street Bridge be complete by then? Kelly, we expect construction of the Spruce Street bridge to be completed sometime on Sunday in time for the Home Opener on Monday.